The wife of a former Thai navy diver who died working to rescue a young soccer team trapped for days in a flooded cave said on Thursday she missed him dearly and urged the boys not to blame themselves for his death. [post_ads]The rescued boys smiled and waved from their hospital beds in the first video clip released on Wednesday after an ordeal that has gripped the world. 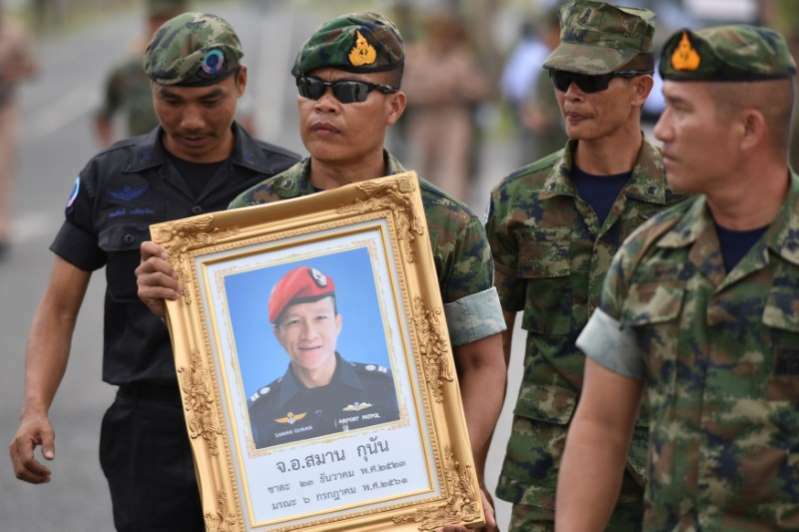 Samarn Kunan, 38, a former member of the elite navy SEALs unit, was the only casualty in a multinational operation to save the boys and their coach after monsoon rains trapped them in the cave they were exploring in northern Thailand. "I love you so much," his widow, Valeepoan Kunan, wrote in the caption to a black-and-white photograph of her husband she posted on her Instagram account. "I miss you," she added. "I love you like you are my very heart...from now on when I wake up...who will I kiss?" The world should remember Samarn, the head of the rescue mission told a news conference at the end of the 17-day operation. "Samarn Kunan is the real hero," Narongsak Osottanakorn said. "On the day that he passed, the entire team was sad, but we used this sorrow. We saw that he gave his life for this cause." A day earlier Valeepoan posted a picture of her hand clasping that of her husband. People from around the world have offered condolences and commented on Valeepoan's social media accounts. "Our hearts go out to you and your family at this difficult time," read one comment. "Your husband is so brave. The world will not forget his kindness and all he did to save those boys." Samarn, an emergency rescue worker at Bangkok's Suvarnabhumi Airport after he left the SEALs in 2006, joined the cave rescue operation on July 1. British divers found the 13 young men huddled on a muddy ledge in a partly flooded chamber inside the cave. Samarn died on July 6 after losing consciousness during a mission to place oxygen tanks deep inside the cave, just two days before the first group of four boys was brought out. "I want to tell the boys, please don't blame yourselves," Valeepoan told reporters.